Great Barrington, Mass. -- Sophisticated travelers who have been to India have likely been awestruck by the splendors of the Taj Mahal, luxuriated on the Royal Train, and dined on Delhi delights. But Alexander Souri, the New York-born son of an Indian father and a French mother, is offering nothing less than a journey that promises to be the experience of a lifetime. 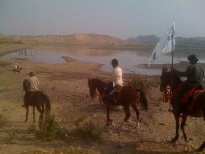 As founder and executive director of Relief Riders International (RRI), this October he will lead fifteen participants on the first of three annual adventure rides (limited space is available at the time of this writing) on a unique horseback ride through the Thar Desert of Rajasthan, India. On this fifteen day sojourn, these humanitarian adventurers will travel through five extraordinarily beautiful remote villages, where they will interact with local residents as they deliver food, medical supplies, medical care, and dozens of goats. 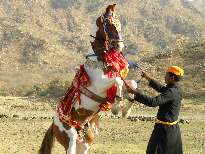 Kanwar Raghuvenvra Singh Dundlod, who is based at Dundlod Fort, a 350-year-old Rajput fort is supplying a special breed of warrior horses from Rajasthan. "The Rajputs prized these animals and consider them to be Deities" says Souri. "They are acclimated to the desert climate and have a fifth gait, the 'Revaal,' which allows the rider to travel a long distance at a trot without posting. In relative comfort, with temperatures expected to be in the mid-80s during the day and dropping to the 60s at night, the group will visit ancient villages and old forts, rich in wildlife such as birds and buffalo. 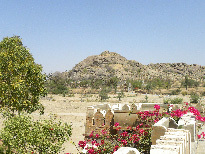 At stops along the way, they will experience the region's unique cultural life, with special performances of traditional dance in Kochor, drumming in Pachar, and tastes of the region's culinary specialties. The participants, who will arrive from various countries, will depart from New Delhi. Based on their individual skills, they will help organize the caravan, distribute supplies, and assist the medical team of eye, ear, nose and throat specialists who will treat hundreds of villagers along the route. The $4800 per person fee, not including airfare, will cover the cost of relief supplies. 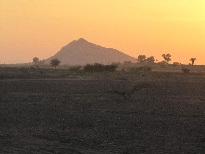 Support vehicles will provide cooks, food, tents, and hot showers. Except for a night's stay at The Imperial Hotel in Delhi, three nights in forts, and a night in a haveli (a traditional Rajput villa), everyone will sleep in tents. Riders will average about three to five hours a day at a comfortable pace, with three stops for meals and ample water available. In addition to the Relief Rider crew, a support vehicle will carry two medics and a doctor. Indian Red Cross personnel have developed the first HIV education program in the region and will distribute educational information and hold discussions in all the villages. A dozen camels will bear food supplies to counter the effects of drought, and goats will go to needy families for on-going sustainability. Alexander Souri has always had a global perspective on life. When he was 8, he learned to ride at boarding school in India, which helped him "deal with missing my parents." He grew up in New York City and traveled extensively in India and France. He's produced plays, directed commercials and industrial films in China, done special effects on "The Matrix" and "X-Men," and at film festivals in Cannes, Sundance, and Venice, Italy. More than once, he's piloted a single engine plane across the Atlantic. Souri bases this innovative trip on the heroes journey — "Joseph Campbell is a hero of mine," he says (see Side Bar). "The desire to do this came from a time of re-assessing my life. I'd lost my father, which sent me off on my own journey. Those of us who travel have known the great gift of experiencing new places, encountering new people, and seeing the world in new ways," he says. "This time we will bring to those places we visit gifts that really matter."